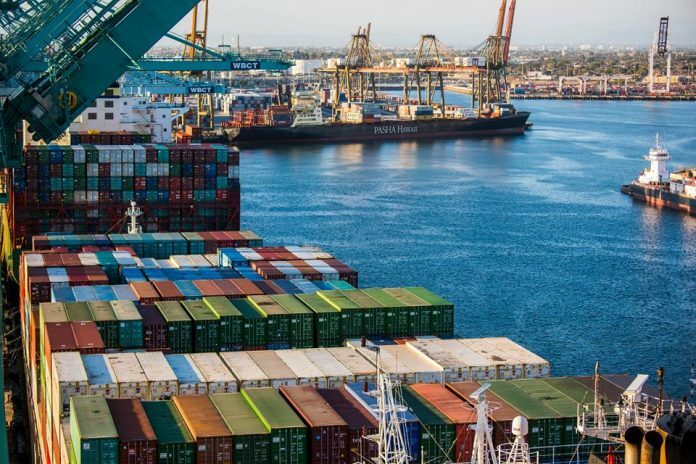 The port of Los Angeles and Long Beach have outlined a draft proposal of their 2017 Clean Air Action Plan Update, as they prepare to achieve emission targets that include their plan to have a zero emission drayage fleet by 2035. In the draft, they outline near-term and long-term strategies to reduce air pollution from the ports, to increase the use of rail for outbound cargo and to support alternative fuels. Los Angeles and Long Beach are the nation’s busiest ports and they handle around 40% of the nation’s import traffic and around 25% export. The draft of the 2017 Clean Air Action Plan sets new goals on reducing greenhouse gas emissions to 40% below 1990 levels by 2030 and 80% below 1990 levels by 2050. The preliminary analysis on implementing the plan estimate the cost at $7 billion to $14 billion. The original Clean Air Action Plan was introduced in 2006. However, this latest and updated version is meant to address the challenges of reducing emissions from port-related sources, such as: ships, trucks, cargo handling equipment, locomotives and harbor craft. This plan carries over the previous 2013 targets for cutting other primary pollutants aimed at reducing diesel particulate matter 77%, sulfur oxides 93% and nitrogen oxides 59% below 2005 levels. Recent data shows that the ports have surpassed the 2023 diesel particulate matter and sulfur oxide reduction targets and they are close to their NOx goal. The new 2017 draft was created two years of dialogue with the industry, environmental groups, regulatory agencies and communities. The ports have had many stakeholder meetings and community workshops and updates to the plan include local, regional, state and federal standards and regulations. “Working closely with all our partners has been crucial to our success,” said Mario Cordero, Port of Long Beach executive director. “That same collaboration went into the development of the 2017 CAAP and will be indispensable going forward. Starting in 2018, phase in clean engine standards for new trucks entering the port drayage registries followed by a truck rate structure that encourages the use of near-zero and zero emissions trucks, with the goal of transitioning to a zero-emission drayage fleet by 2035. Developing a universal truck appointment system for the entire complex with the goal of minimizing truck turn times. Continue to explore short-haul rail, staging yards, intelligent transportation systems, and other supply chain efficiency improvements. Expand use of on-dock rail, with the long-term goal of moving 50% of all inbound cargo leaving the ports by rail. Develop infrastructure plans to support terminal equipment electrification, alternative fuels, and other energy resource goals. “It’s important for industry to know the ports will affect change in a way that keeps those industries economically viable. It’s not just about cleaner air, but also getting cargo through, and creating jobs so business can proper and thrive here,” said Lee Peterson, Port of Long Beach media relations specialist. Previous articleCan the ELD Mandate be delayed by the new Proposed Bill? Next articleDriving on the Edge!